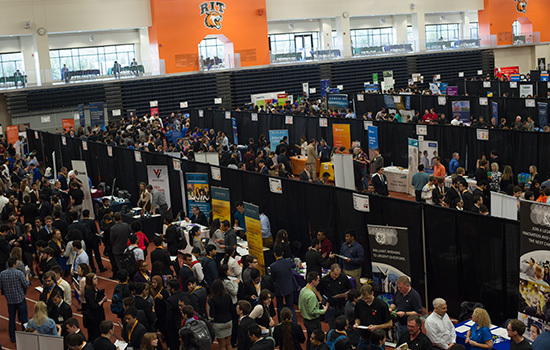 More than 250 employers were on hand to meet with RIT students and alumni at the 2014 Fall Career Fair. It was the largest RIT career fair on record. A diverse range of employers attended, including computing technology companies Google, Microsoft, Apple and Facebook; engineering companies Tesla Motors and Toyota; government agencies and start-up companies. Dramatic changes in the demographics of the college-going population will make it more important than ever for RIT to continue its tradition of affordability and access. Increasing the amount of financial aid available to students will help us sustain and enrich the student diversity so necessary to the creativity and productivity of the university community. RIT is committed to leading the affordability charge by addressing price and student financial capacity, by ensuring ample financial aid to accommodate high-need students, and by introducing technological solutions to reduce costs while improving learning outcomes. Recognizing that affordability is as much about quality outcomes as costly input, we will provide the next decade’s students with the skills and knowledge necessary to succeed in satisfying and remunerative careers that will justify the expense of undergraduate and graduate education. Our students’ return on their tuition investment will come not only in the material form of future earnings, but also in their ability to effect positive change, contribute to the social good, and continue on a path of lifelong learning. RIT will be the university with the best placement rate and return on investment of all private universities in the United States. RIT will become the university that best utilizes educational technology to improve access, maintain academic quality, and achieve desired learning outcomes while balancing costs. RIT will launch a blended capital campaign entitled “Greatness Through Difference” to raise the public, private, and research funding necessary for the achievement of critical “Difference Makers” in the 2015-2025 strategic plan. RIT will develop alternative methods of raising revenue, including developing innovative, fully online workforce development programs for nontraditional students, increasing opportunities for venue rentals by external parties, and providing services to the Rochester community. Publicize and deliver on a guarantee that no student in good standing within 15 credits of graduation will drop out because of insufficient funds for the remaining tuition. Using the model of “RIT Online,” the ILI (Innovative Learning Institute) will identify, develop, and deliver courses and competency instruction to enhance the career advancement of alumni. Direct a specified amount of funding from the capital campaign scholarship drive to support low-income and under-represented students.